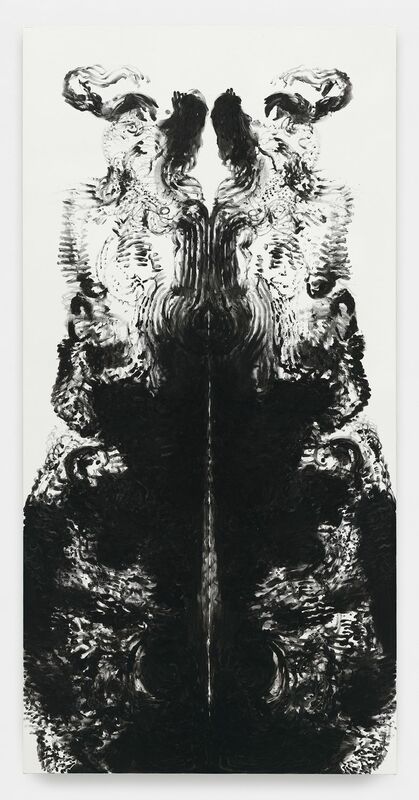 Hauser & Wirth is pleased to announce Mark Wallinger’s debut solo exhibition with the gallery. Both Savile Row spaces will host a presentation of new paintings and multi-media works. In this exhibition, Wallinger encourages a contemplation of the self within a society in which behaviour and personal identity come under increasingly closer scrutiny. Wallinger utilises Sigmund Freud’s terms, id, ego and superego in an interrogation of the psyche, the self, and the subject. The work examines how, as human beings, we operate between our instinctual urges, our attachment to our identities, and the ways in which we judge ourselves as members of a certain culture. Entering into the North Gallery, the first work is ‘Ego’ (2016). Two iPhone photographs depict the hands of their creator: the artist Mark Wallinger. 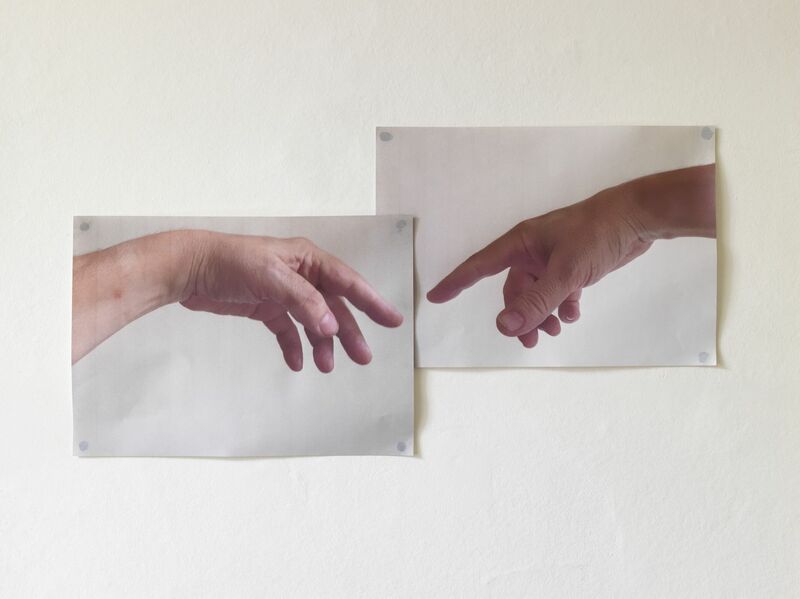 The work, doubly hubristic, is a playful recreation of Michelangelo’s ‘Creation of Adam’. The remainder of the gallery is devoted to a new body of work: the id Paintings. According to Freud, the id, driven by the pleasure principle, is the source of all psychic energy. The paintings are the record of actions that appear to be intuitive and guided by instinct, thus echoing the primal, impulsive and libidinal characteristics of the id. These monumental paintings have grown out of Wallinger’s extensive self-portrait series and they reference the artist’s own body. His height – and therefore his arm span – is the basis of the canvas size. They are exactly this measurement in width and double in height. Wallinger uses symmetrical bodily gestures on the two halves of the canvas to mirror one another. 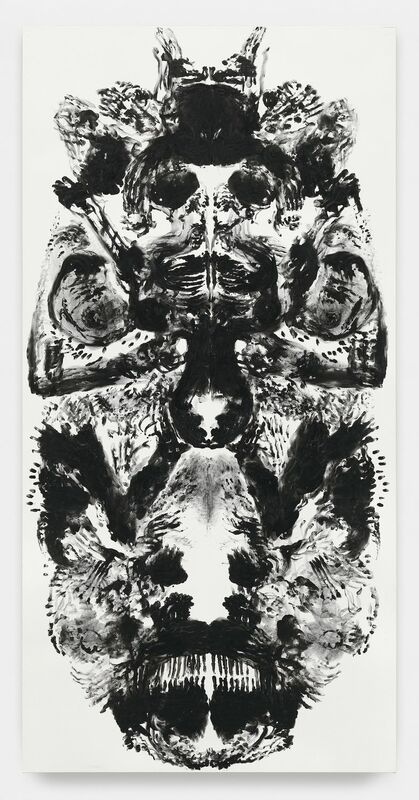 This recalls the bilateral symmetry of Leonardo da Vinci’s ‘Vitruvian Man’ and more explicitly the Rorschach test. Created by sweeping paint-laden hands across the canvas in active freeform gestures, the id Paintings bear the evidence of their making and of the artist’s encounter with the surface. In recognising figures and shapes in the material, the viewer reveals their own desires and predilections while trying to interpret those of the artist. In the South Gallery, the visitor is confronted initially by a new sculptural work, ‘Superego’ (2016). In contrast to the id the superego acts to perfect, civilise, control, and suppress our behaviour. ‘Superego’ is an entirely mirrored form inspired by the revolving New Scotland Yard sign. This sign itself is a brand, a logo, and seat of authority. It is the all-seeing eye omnipresent and omniscient. Its constant rotation symbolises the ceaseless energy and vigilance of the police. 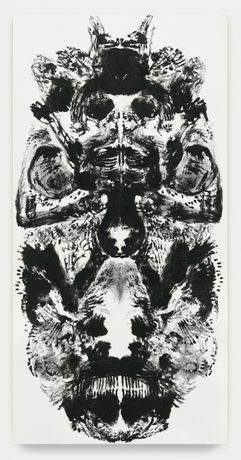 Through the abstraction of this symbolic totem, Wallinger produces an enigmatic symbol of dominance. The sculpture’s reflective surface offers the promise of our own self-reflection and recognition. Here however, the mirrors revolve implacably above the viewer’s head. Their purview is remote and inaccessible. ‘Ever Since’ (2012) is a life-sized projection of a barber’s shop front. The only thing that appears to be moving is the barber’s pole outside. Closer inspection reveals the truncated progress of the second hand of the clock inside. Two seconds loop endlessly. The way that we perceive movement in film is different to the way we perceive moving objects in real life, since film images do not really move at all. Displaying a series of consecutively photographed still images, in quick succession, creates apparent motion. The barber’s ever rising red and white spiral is an illusion, yet here it can be seen as an illusion of ‘endlessness’. One revolution of the pole lasts two seconds. It is a silent film of time passed that is forever passing. For ‘Shadow Walker’ (2011) Wallinger captures his shadow walking along Shaftesbury Avenue. The shadow moves fluidly over passing strangers and slides up and down the kerbstones. It navigates the chewed gum, spilt alcohol and worse. Before long it assumes an autonomous existence as ‘real’ as the artist’s actual body. His creation becomes a modern-day version of Peter Pan’s lost shadow. Wallinger’s new video work, ‘Orrery’ (2016) takes as its subject the New Fairlop Oak in the centre of Fullwell Cross roundabout in Barkingside. This tree was planted in 1951 as part of the Festival of Britain to commemorate the legendary Fairlop Oak that had stood for centuries in Hainault Forest. ‘Orrery’ takes its name from the mechanical model that articulates the positions of the planets and moons. Within the gallery, the work is presented on four screens mounted on stands representing the four seasons, reiterating the pedagogical nature of the Orrery. The work was created using an iPhone blue-tacked to the driver’s side window. In this way the tree is presented in a revolving dance within the constancy of the frame. The oak tree on its island is a cameo of Britain destined to rotate in its tiny orbit endlessly. As the world around the tree revolves, the sun moves across the screen. This revolution of a municipal roundabout in Essex becomes a contemplation of the orbit of our planet around the sun and our place in the universe.